Description: The monument honors the connection between the 343 New York City firefighters who lost their lives on September 11, 2001 and the Marines who fought during the conflict in Iraq in 2003. A low granite marker contains a bronze plaque with the commemoration, connecting the "leather helmets" (the firefighters) with the "leathernecks" (the Marines). A bas-relief image of firefighters raising the American flag at Ground Zero is displayed on the bottom left side of the plaque. The right side of the plaque depicts Marines engaged in the same act of flag-raising, with a bas-relief of the iconic image of Marines raising the flag over Iwo Jima. A portion of a steel beam recovered from the World Trade Center rests on the top of the stone, as it slants to the ground, giving the memorial an abstract form and an overwhelming feeling of weight. Unveiling & Dedication: The beam was dedicated on a rainy July 3, 2003 in New York City in front of the New York Stock Exchange. It was blessed by Father Chris Keenan, Chaplain of the Fire Department of New York City (FDNY) before beginning its trip to North Carolina. Bagpipers played the Marine Corps anthem for the beam's sendoff. Members of the FDNY presented the beam to the Marine Corps Base and II Marine Expeditionary commanding generals in a ceremony at W. P. T. Hill Field at Camp Lejeune the following day, July 4, 2003. Post dedication use: The memorial and surrounding gardens have been the site of annual Patriot Day services since 2006. Subject notes: Funds were collected by North Carolina residents, including service personnel and civilians, for donation to the Fire Family Transport Foundation in New York City following 9/11. The FDNY donated the beam in honor of the generosity of this aid and the extreme sacrifices made by service personnel from Camp Lejeune in the Iraqi conflict and the war on terrorism. The beam was escorted to North Carolina by several hundred FDNY firefighters who were given tours of the base and weapons demonstrations during their visit. The FDNY also presented a leather firefighter's helmet to the base. Location: The memorial is located in the Lejeune Memorial Gardens near the gates of Camp Johnson in Jacksonville. The Gardens are located within a triangular area bounded by Lejeune Boulevard, Montford Landing Road, and Highway 17. Landscape: The monument is located at the center of a circular brick plaza in the garden and park setting. 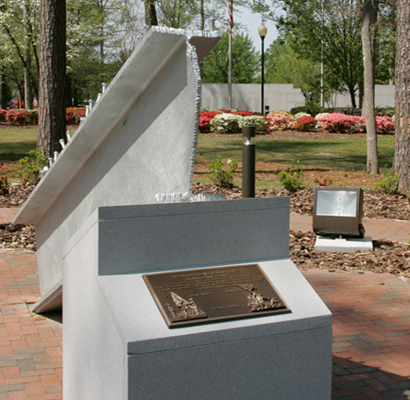 The Onslow County Vietnam Memorial and the Beirut Memorial are located nearby in the Gardens.